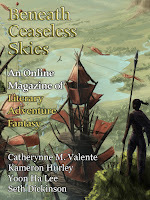 "The Limitless Perspective Of Master Peek, Or, The Luminescence Of Debauchery," by Catherynne M. Valente [bio] (edited by Scott H. Andrews), appeared in Beneath Ceaseless Skies issue 200, published on May 26, 2016. Pro: The wordplay and allusions are astonishing. Every character's name means something: Prospero wants money, Pomposo wants to be a lord, Perpetua will live forever, Perdita has lost both eyes, Proteo (aka Samartiana) changes form, Master Peek can see everywhere, etc. Complex circumlocutions are followed by hilariously brusque summaries. 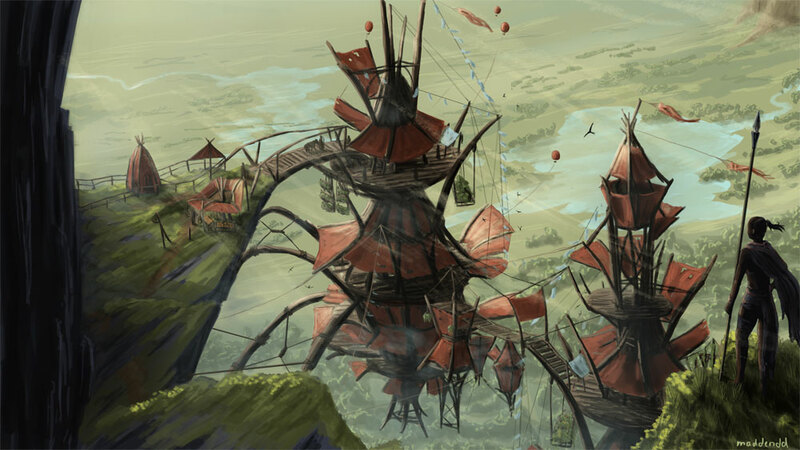 And the story is rich with references to history and mythology. For example, Perpetua's "unmentionable" ancestor is Polyphemus, the cyclops, from whom she inherits her size, hairiness, and, of course, her single eye. The gender bending fits naturally into the story, and it's everywhere. Her metamorphosis into a man comes from economic necessity, not gender identity, but she finds it suits her, and she refers to herself as a man thereafter, so we will too. Cornelius has a sexual adventure with the young man, Plutarch, which Plutarch doubtless thinks is homosexual, even though it isn't, exactly. The Dodge has a homosexual relationship with Samartiana, even though everyone (including the Dodge at first) think's it's heterosexual. Cornelius and Samartiana have a heterosexual relationship, but the genders are opposite from what the public thinks. Con: This story takes the form of a tale, not a story, hence it doesn't have a plot. Cornelius merely tells us the events that happened; he isn't really trying to accomplish much of anything himself, and his successes are as likely to be the result of luck as his own efforts.